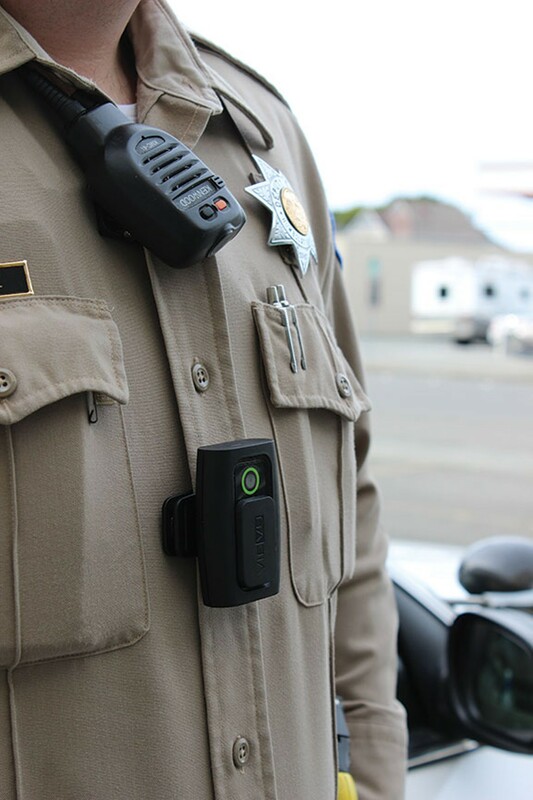 Two of Humboldt's smallest police agencies push forward with officer body cameras. What's keeping the big boys from following suit? 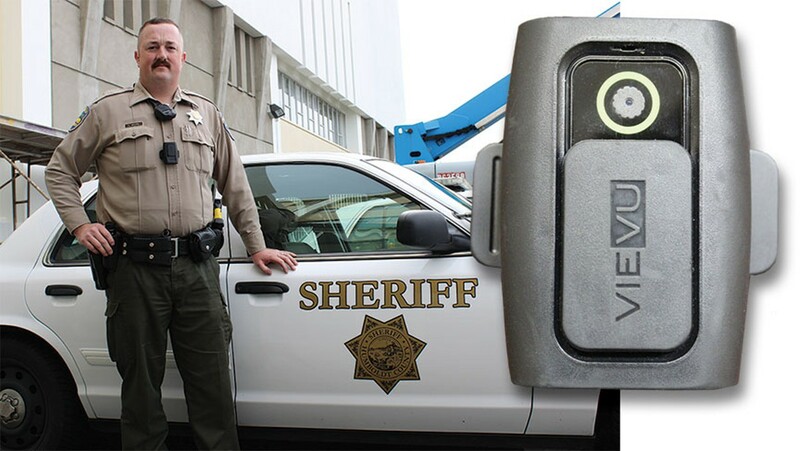 The Humboldt County Sheriff's Office recently had deputy Conan Moore wear a body camera while on patrol for two weeks as a part of a pilot project testing the technology. It can now be argued that the most cutting edge and progressive cops in Humboldt County now patrol the streets of Rio Dell and Ferndale. 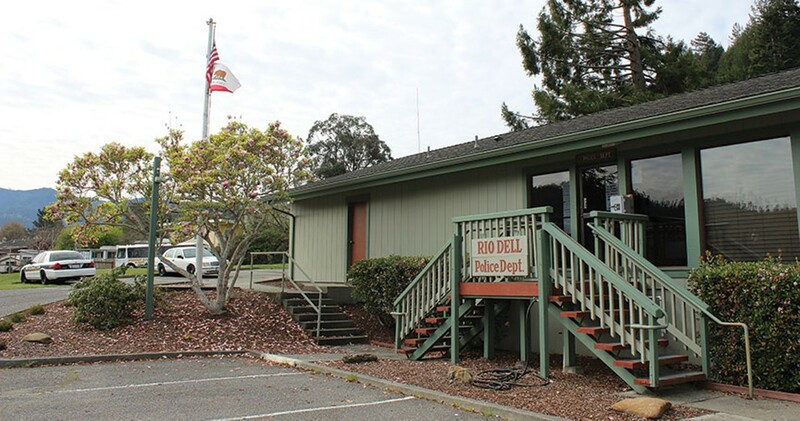 after the local chapter of the American Civil Liberties Union passed a resolution calling for all police officers in Humboldt County to wear body cameras while on duty, the Rio Dell City Council voted unanimously — at its chief's request — to take the plunge. On March 3, the council approved the purchase of five body cameras — one for each of Rio Dell's officers and the chief — and a data storage unit to keep the recordings. Chief Graham Hill said he expects his four officers to be wearing the small cameras on their lapels, near their badges, in a matter of weeks. Meanwhile Ferndale's five sworn officers, including Chief Bret Smith, have been wearing body cameras for almost three years, having quietly adopted the technology before events in Ferguson, Missouri, and elsewhere made the cameras a national talking point last year. So does that mean the public will have live-streaming access to all law enforcement contacts in the small Eel River towns south of Fortuna? Does it mean every dispute with law enforcement will be imbued with newfound clarity? Why aren't other agencies all aboard the body-cam movement? The answers to these questions are no, definitely not, and it's complicated. But virtually all heads of local law enforcement agencies agree that body cameras will soon be an industry standard, allowing communities to better hold everyone accountable, criminals and cops alike. Lending rocket fuel to the national police body camera movement in recent months was Ferguson police officer Darren Wilson's shooting of an unarmed Michael Brown in August of last year, setting off months of protests that arguably deepened the nation's racial divide and brought public mistrust of officers to new levels. Camera advocates expect a body camera video could have given the nation clarity, offering an unvarnished view of what Wilson saw as he pulled the trigger of his service weapon 12 times. Locally, some are asking what would have happened if three Eureka cops were wearing body cameras when officer Stephen Linfoot opened fire on 22-year-old Thomas McClain in the front yard of McClain's Allard Avenue home on Sept. 17? The video would have shown what the officers saw shortly after midnight when Linfoot shot and killed McClain, saying he believed McClain was reaching for a handgun, which turned out to be an unloaded BB gun. 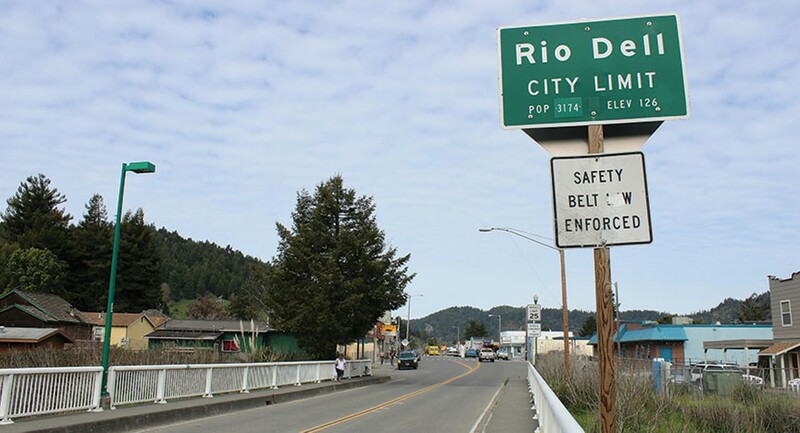 Sitting in a small conference room at Rio Dell's police headquarters, a green wing of city hall tucked off Wildwood Avenue, Hill smiles warmly, recalling his first days on the job in the town of 3,300 that sits just across the bridge from Scotia. "Scotia was where people worked, and Rio Dell was where people played," he says. "That reputation kind of stuck around. When I first started here, you could find people out on the streets at all hours. It was a busy job. But it's different now." Hill, with his closely cropped gray hair and a neatly trimmed mustache bleeding into stubbly goatee, says he was always interested in police work but took a roundabout path to the profession. Raised in Fairfax, California, Hill says he worked a series of odd jobs for construction companies and ski resorts before landing on the North Coast to attend Humboldt State University, where he studied geography for a time before withdrawing and entering the police academy at College of the Redwoods. There, he had an instructor who urged him to sign on as a reserve officer somewhere, mostly just to go through the background check process and get a bit of experience. Rio Dell, the instructor said, was hiring. "And here I am," Hill says with a chuckle, noting he's been with the department for almost 20 years, serving the last 11 as its chief. Hill says he and his officers have long talked about the potential benefits of body cameras. 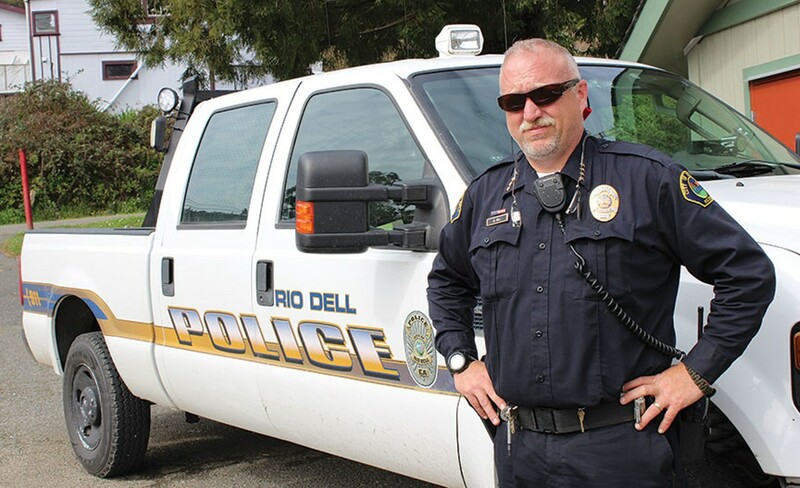 Rio Dell cops have been outfitted with audio recorders for a couple of years, and the devices have proven useful in capturing witness statements and documenting officers' interactions with the public. Cameras seemed the logical next step. The only barrier was price. The cameras retail for about $400 apiece, then there's the costs of storing all the digital footage, maintaining and replacing the equipment and getting IT help when something goes haywire. It's a lot for a department in a city that just raised taxes and is coming out of a budget stretch so dire the city sold its police dog in 2006 to make ends meet before reducing its force from eight sworn officers to five in 2011. But the department came into some unexpected cash recently in the form of state money set aside to help cities deal with the impacts of 2011's prison realignment laws. Hill jumped at the opportunity and the council backed his play, allocating more than $15,000 to outfit his five officers with body cameras and dash cams for their vehicles, as well as a data storage system. "I think we're going to find that this type of technology is going to be the standard in most police departments everywhere," Hill says. "I think that's the direction we're headed in." To Hill, the potential benefits of body cameras are abundant. There are the obvious things that have made the cameras a focal point in the national discussion of police transparency: their ability to lend clarity to citizen complaints and critical incidents — most notably officer-involved fatalities. "It's a good backup for officers as long as they're doing in the field what they're supposed to be doing in the field," he says. But Hill sees lots of other advantages, too. The cameras will capture evidence that can ultimately be shown to a jury, showing exactly what a defendant did or what was found during a search, laying waste to defense arguments of planted evidence or an officer-fabricated stumble during a field sobriety test. The cameras purchased by Rio Dell also allow an officer to review footage in the field and, for example, figure out exactly where a suspect tossed a weapon during a foot pursuit. There's also a training element, as Hill envisions officers reviewing footage of different situations to make sure they are following best practices for officer safety, much the way pro athletes review game tape to improve their technique. "Those are some pretty big things that I think are good tools," Hill says. Humboldt County Sheriff's deputy Conan Moore steps into an interview room at the department's main station and sits down. Tall and barrel chested, Moore pulls a body camera off his shirt and puts it down on the table. It looks like an old pager — a black rectangle a few inches long and a couple wide, with a clip on the back. Moore's been wearing the thing on patrol for a couple of weeks as a part of a pilot program for cameras in the field. Moore's patrol beat runs from Eureka down to Redcrest and out to Petrolia, and he works midnight-to-noon shifts, which he figures is why Sheriff Mike Downey chose him to test the camera, wanting to see how it performs in a variety of settings and stages of daylight. "I hope we get these pretty soon," Moore says, adding that he has nothing but good things to say about the prospect of a full deployment of body cameras. "The way I see it, if you have nothing to hide, these won't do anything but help you." As an example, Moore points to a probation search he'd conducted about a week earlier. He had a suspect sitting on the couch of a known drug house when someone else walked into the room, causing Moore to look over, taking his eyes off the guy on the couch. When they searched the residence a short time later, Moore said they found a bundle of "contraband" — he wouldn't be more specific because the case is pending — under one of the couch cushions. But, because the bundle was found in a house full of known prior offenders, Moore said it was impossible to know whose it was and who should be charged with possessing it. At the end of his shift, Moore said he downloaded the video from his body camera and watched the footage from the search. He was surprised to see on the video that, at the moment he was distracted, the camera caught the original suspect stuffing the bundle under the couch. When it comes to evidence collection and documentation, Moore says there's simply no question the cameras would be an asset. Others agree: Ferndale Chief Bret Smith says, "When it's right there on video, you've got the best evidence in the world," while Arcata Chief Tom Chapman says, "The evidence component is huge. Whatever that saying is: A picture's worth a thousand words." But Moore says evidence collection is just one of many potential benefits of the new technology. For a bigger-picture example, Moore pointed to a study conducted with the Rialto Police Department in which researchers outfitted a group of officers with body cameras and then tracked complaints and officers' use of force. The researchers were working under the theory that most people alter their behavior when aware that they're being observed. Feeling a heightened need to conform to societal rules, they become more prone to exhibit socially acceptable behavior. The hypothesis was that police-worn cameras might make everyone involved in police contacts behave better, noting that "rational beings, including police officers, are unlikely to embrace socially undesirable behavior when videotaped." The results of the study were staggering. Incidents of use of force by officers wearing cameras came down 58 percent, and the rate of citizen complaints dropped 88 percent. The ACLU and others have interpreted the study to mean officers wearing cameras are less likely to be rude to citizens and needlessly use force on suspects. But Moore says he sees it as just the opposite: Suspects who know they are on camera are less likely to resist or run, and much less likely to file false complaints. Moore feels like he saw evidence of this when wearing the camera around Humboldt in recent weeks, saying there were a few instances when someone was jumpy when initially contacted but seemed to calm down once realizing they were on camera. In Ferndale, Chief Bret Smith says his department sees fewer citizen complaints since deploying body cameras. "If someone does come in to complain, I tell them, 'Well, let me review the video and see what happened.' Most of the time, you never hear from them again," he says. Back at the sheriff's office, Moore says it's nice to have the backup a camera provides. Some people can get pretty heated when you give them a ticket, he says, recalling having I'll-ruin-your-career threats hurled at him before. "It makes you a little bit uneasy when people threaten you like that," he says. "I mean, we have families and this is our job. It'll be good to have that peace of mind (that the cameras provide)." This all raises the question: What's the hold up? 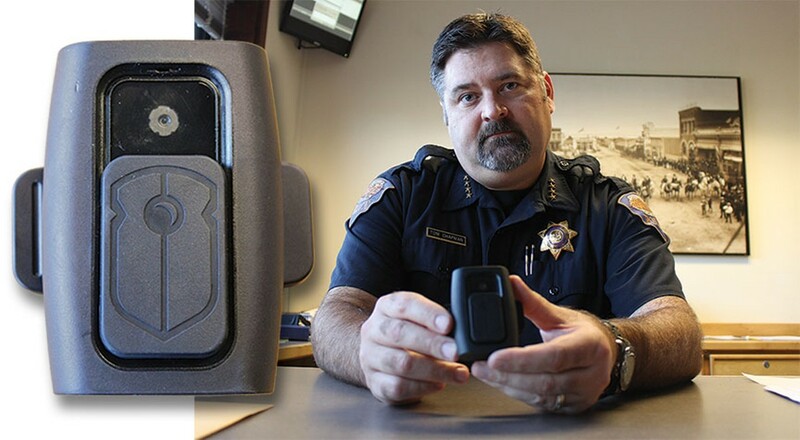 Eureka Police Chief Andy Mills, Arcata Police Chief Tom Chapman and Downey all say body cameras are the technology of the future, so why are Humboldt's biggest departments being beaten to the punch by the likes of Rio Dell and Ferndale? After pausing his interview with the Journal briefly to answer a call coming into the Rio Dell police station's main line, Hill says he's still hammering out exactly what his department's body camera policy will be. On the surface, he says, it's pretty simple. "Any time an officer makes contact with someone in the field, they're going to turn it on," he says. "When the contact's over, they're going to turn it off." But thinking it through a bit further, Hill concedes it gets complicated. Say an officer is coming out of the local gas station with a cup of coffee and a citizen walks up to complain about speeding in his or her neighborhood, does the camera go on? What if the officer is talking to a confidential informant, or a victim of sexual assault? What if he or she is just walking the beat and saying hello to passersby? These are difficult questions to answer in policy, says Arcata Police Chief Tom Chapman, whose department has tested body cameras in limited situations. "The officers aren't always going to know when something is going to go sideways," Chapman says. "The big concern is having a policy in place to deal with when it goes on and when it goes off." Then, he says, there's the challenge of figuring out what to do when the camera doesn't go on or off when it should. By policy, should every officer who doesn't turn the camera on at the point of contact with a civilian be disciplined? What if it was a situation where a casual hello "went sideways," in Chapman's words? And just as difficult to figure out, what happens to the footage if an officer flips the camera on and then forgets to turn it off, taking it into the restroom with him or her? With one of the goals of body cameras being transparency, Chapman and Downey both said they ideally want these questions vetted out in policy, so there's no public perception that departments are making things up as they go. And both say they fear the day a critical incident occurs that isn't caught on camera, because of malfunctions or a forgetful officer. Hill concedes that day is going to come in Rio Dell. "We're not infallible," he says. "There's a human element here. Undoubtedly, there's going to be a point in our history where something should be recorded that won't be. That's just life." The ideal, most agree, would be for officers just to turn their cameras on at the start of their shifts and leave them rolling until the end. But keeping all that digitally recorded footage takes a tremendous amount of data storage, which can get expensive in a hurry. A recent story in Police Chief Magazine mentions that a department with 200 sworn officers recently estimated that it would need 1 terabyte of storage annually for every six officers on its force, based on the conservative estimate that officers would record about one hour of footage per workday. Based on those calculations, recording entire shifts would require more than a terabyte of storage per officer per year. To put that number into perspective, Rio Dell spent almost $1,000 on the 1-terabyte data storage device it hopes will keep all its officers' footage for years into the future. To record all contacts, Arcata would need to spend about $4,000 on storage annually. With more than 45 deputies on patrol, the Sheriff's Office would have shell out about $10,000. And this leads to the question of how long agencies should be keeping this footage. There are currently no industry best practices because the technology is so new, so Smith and Hill said their agencies are following the same rules that apply to other police records, which is five years. Based on those numbers, it seems the sheriff's office would have to spend about $68,000 to get a body camera program rolling for its deputies — $18,000 for the cameras and $50,000 for five years' worth of space to store recorded contacts. And that doesn't include ongoing maintenance and replacement costs, or IT help. Eureka Police Chief Andrew Mills recently announced his intent to repurpose about $60,000 in city funding to purchase body cameras for his department. But in discussing the issue with the Journal back in January, Mills made clear that cost was not the biggest hurdle in the body camera discussion. Instead, he pointed to questions about how the footage will be handled and stored that need to be addressed before a full rollout. There's also the question of just how much of this footage the public will get to see. It's easy to hear the terms "police body cameras" and "transparency" used together and think all footage will be immediately available for public review, but that's not going to be the case in California. The California Public Records Act works under the assumption that all records created by a public agency should be disclosed to the public. However, the act carves out a list of exemptions — things that an agency can simply opt not to disclose for a variety of reasons. One of those exemptions covers police investigative files, leaving agencies wide discretion as to what, if any, records they release from police investigations, including video. This exemption doesn't just apply to ongoing investigations, but to historic ones, too, meaning an agency that doesn't want to disclose a record or a video from an arrest doesn't have to. Smith says that, to date, Ferndale hasn't received a single request for any of its body camera footage, so he isn't sure exactly how the city would deal with one. Hill similarly says he's unsure how Rio Dell is going to handle such requests moving forward. It's an interesting question because the footage has the potential to be extremely sensitive. Consider all the myriad of things people tell police officers, ranging from the private — things like addresses and driver's license numbers — to the intensely personal, like family dynamics and the details of a sexual assault. Most would argue there are compelling reasons to keep a lot of that information out of the public eye. The Seattle Police Department is in the midst of a pilot body camera project in which it is posting blurred, soundless versions of its video footage on YouTube for all to see. But after spending some time watching the Rorshach-like silent footage, one wonders how much transparency is really being achieved. Even in their original form, some fear the videos might not offer clarity in the type of incidents that are fueling the body camera push. In his story for Police Chief Magazine, Larry Capps cautions that these cameras do not offer a sharp 360-degree recording of an event. Instead, they offer one view, at one angle, on one plane. Capps urges readers to think about the world of sports, where umpires' calls remain the topic of heated debate even after viewers dissect video shot by professionals on a stable platform with state-of-the-art equipment from numerous angles. With police body cameras, viewers will get a single angle from a camera attached to an officer's chest, which may be heaving from adrenaline or exertion. But local chiefs say one camera angle is clearly better than none, though they agree with Capps that "unrealistic expectations must be managed." This seems to be another reason those leading some of Humboldt's largest police agencies seem content to watch this issue unfold, to let someone else deal with all the hiccups and headaches of determining best practices and industry standards as the public gains a more realistic understanding of what these videos are. They're also cautiously eyeing some proposed state legislation that may force the issue. Meanwhile, two of the county's smallest agencies continue charging forward. Sitting in the station in Rio Dell, Hill smiles when asked about all the what-ifs of policy and disclosure. "I'm kind of a learn-by-doing person," he says. "We'll work the bumps out as we go." Assembly Bill 65 (Assemblyman Luis Alejo): Would provide local departments with funds to purchase body cameras for officers throughout the state. Assembly Bill 66 (Assemblywoman Shirley Weber): Would create a state task force to research police body cameras and develop state policies based on best practices. Assembly Bill 69 (Assemblyman Freddie Rodriguez): Would require all law enforcement officers statewide to wear body cameras while on duty. Senate Bill 175 (Sen. Bob Huff): Would require all departments using police-worn body cameras to develop a policy governing their use. Senate Bill 195 (Sen.): Would state the intent of the Legislature to enact legislation to protect the privacy of individuals recorded by police body-worn cameras.